“Seoul Station” starts off quite strong and promising, but in time, it lost a little bit of its appeal. One thing that it has going for itself is that animated zombie flicks aren’t commonplace, which sets this one apart from other zombie movies, but also animated films. I also absolutely loved the art style, which reminded me a lot of “The Garden of Words”. The entire movie looked absolutely stunning, and at least visually, it never got old. The backgrounds were especially impressive, occasionally looking like photographs, and not drawings. And the blurred motion effect was a nice touch, too. I also really loved how the outbreak started, and the inherent social criticism, especially when it comes to the way we deal with the homeless. Equally nice was a later scene concerning the police and the military, when survivors are stuck behind a roadblock and are ordered to disperse this “illegal assembly”. If only there had been more scenes like that. However, after a nice start, “Seoul Station” increasingly started to drag along. My main beef with the movie were the characters, who didn’t always act in the most clever way. Now, I get that this definitely is an extreme situation and that they fear for their lives, but things like them repeatedly forgetting to close doors behind them, her (there aren’t any character names on the IMDB yet, sorry) not calling her boyfriend before they head down the subway (having him believe that they’re still on their way to the hospital), the reluctance to text when you’re not able to reach someone, standing around and staring at the zombie hordes instead of running away, or them not getting into the car as soon as she told them were she is. The list goes on and on and on. Despite a short running time, the movie also felt far too long, and got boring and tiresome after a while. The latter probably was mostly due to some very over the top scenes where people act extremely hysteric. I’ve seen dramas about terminally ill people where there was less crying than in this one. I know that these exaggerated emotional scenes can be found in many Korean and/or Asian movies, and it’s mostly definitely a cultural thing, but for me, when it gets too much, it becomes not only tiresome but also unintentionally hilarious. I mean, I’m pretty sure that we’re not supposed to laugh at them when they break down crying, right? Overall, I would have preferred the characters to be just a little more subdued. Nevertheless, the nice idea of an animated zombie movie, and especially the stunning visuals, at least partially make up for the things that didn’t really work for me. 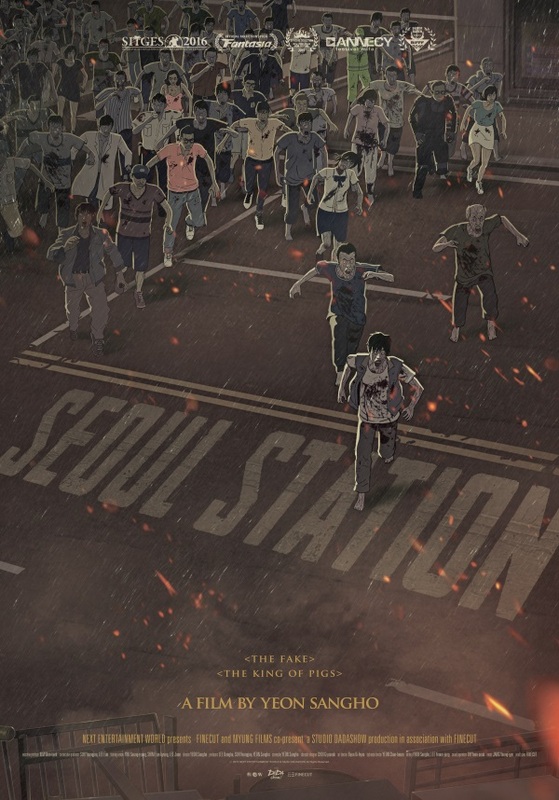 Thus, it’s definitely watchable – but having seen “Train to Busan” (which this is kind of a prequel, or sidequel, to) I can say with assuredness that you don’t have to see this one to enjoy (or understand) the other, which is why I’d suggest to skip “Seoul Station” and instead hop straight onto the far superior “Train to Busan”. This entry was posted in /slash, cinema 2016, movie reviews, new releases and tagged /slash, /slash 2016, cinema 2016, Sang-ho Yeon, Seoul Station, South Korea. Bookmark the permalink.